An ancient instrument transforms into a modern-day good time with this emerald kalimba. A smooth pine board and an eye-catching emerald-green finish transform an ancient instrument into a modern music maker ready for jam sessions. This petite piano carries with it thousands of years of African musical tradition. 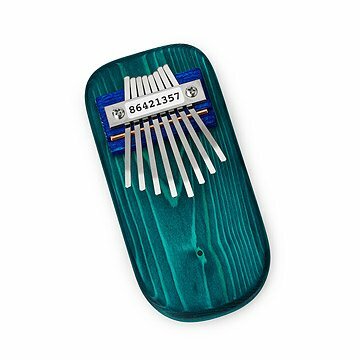 Called a kalimba, mbira, mbila, or marimba depending on the region in which it's played, the first version of this handheld thumb piano appeared more than 3,000 years ago! Lightweight and portable, it was the chosen instrument of traveling troubadours, who would retell the history of their tribe in song. Whether you use this version to strike up your own story or to teach little ones music basics, Paul and Sue Bergstrom's handcrafted thumb piano is the perfect instrument to carry a tune. The eight numbered tines, or keys, correspond with traditional notes on the diatonic scale. The tines are made of tempered spring steel that is hand-cut and rounded. To play, just cradle the instrument in your hands an pluck the tines with your thumbs. Handmade in Blairsville, Georgia. Nothing brings Paul and Sue Bergstrom more joy than sharing their love of music. The couple, who live in the mountains of north Georgia, craft Kalimbas—a type of thumb piano that originated in Africa—out of gourds and wood. When Paul creates an instrument, he works to "feel" the sound. "Only after my wife has installed the key set and tuned it do I get to hear the end result of my work," he says. Aesthetic beauty is just as important, even when it can't be seen. A few years ago, Paul recalls a show where a young blind girl chose her own Kalimba. When she found her match, a cannonball gourd, she knew instantly. "She said, 'It's beautiful, I can feel it,'" shares Paul. "In that moment, my wife and I realized that what we were doing was very right." Emerald Thumb Piano is not amp-compatible. Great gift for my 4 year old (but my 6 year is obsessed with it too!). He loves music and this has just the loveliest tone to it. Very peaceful instrument that lets him be creative. Highly recommended. To add to a relaxing experience. These thumb pianos are the bomb! We got this for our 13 year old musician son, but the whole family couldn't put it down! I wish I bought this for myself. Everything about this product is great! I have no cons. I bought 2 for my adult children for Christmas. They both loved it. Would recommend to all. This is a Christmas present so only I have played it a little. The little music book was helpful and I could actually play a song. It was a gift for a therapist friend, for her to use with her patients. She said she liked it.